We've all heard the cliché phrase "dance like nobody's watching" a time or two before in our lives, and most of the time that particular phrase is used in reference to living your life out loud, enjoying the good times, not worrying about what other people might think, and so on. So now imagine that you're at an event, of your choice, and the (#SnyderEntertainment) DJ plays your favorite song! Suddenly, you're breaking out some dance moves that you didn't even know you could do, the dance floor lights are changing colors and moving to the beat of the music, and you're surrounded by your closest friends all turning up and turning out! Incredible. Memorable. Euphoric. Now imagine that exact same scenario but under basic overhead lighting, probably similar to the lighting that you're sitting beneath right now. It just doesn't feel quite the same, does it? Well that's because the correct type of lighting can instantly change a room, it can turn a bad mood into a great one, and it can encourage even those with no rhythm to grab their boogie shoes, break out their best dance moves, and add good vibes at the flick of a switch. Dance floor lighting has the power, as our cliché phrase from earlier reminds us, to dance like nobody's watching, to live in the moment, to create memories. Now, don't you want to bring that amazing imaginary vision to life at your next event? Well I know that I do and for thousands of our past clients, they wanted to do the same thing! So keep browsing below to learn more about Snyder Entertainment's must-have dance floor lighting..
As many of you already know, all four of our entertainment packages include dance floor lighting, and this goes for all types of celebrations! We bring dance floor lighting because we want to encourage you and your guests to enjoy the event to the absolute fullest! Our dance floor lighting is a must have element of entertainment for each and every event atmosphere because it creates a true atmosphere and ambiance around the dance floor that's inviting, encouraging, and elevated. In fact, most of the time when I talk with prospective clients about including our dance floor lighting at their next event, I usually get asked a few of the same questions..
Q : Are your dance floor lights similar to lights in dance clubs and bars? A :: Yes and no. The image of dance floor lights that you have in your mind are probably very flashy, strobe style lights that only a few colors at a time, and that are often too bright to see past. Well our dance floor lights are referred to as intelligent lighting fixtures. This means that they are moveable, color changing, and controlled from our DJ's iPad's or mobile phones. Our lights are customizable and your DJ will set them to your preferences prior to your event. Q : Will the dance floor lights be turned on during our first dance? A :: No, not unless you want them turned on. 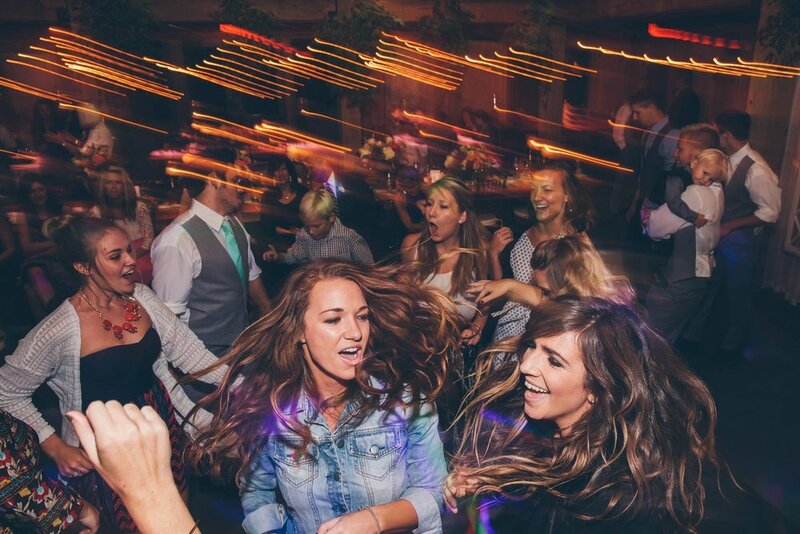 Our staff of professionally trained DJ's know that you probably don't want the dance floor lights changing colors to the beat during your first dance, so we'll keep those turned completely off until the dance floor officially opens for the night. Q : How big is the set-up and equipment for the dance floor lighting? A :: My favorite way to describe our dance floor lighting is to imagine the shape of a large, steel letter "T" with two levels of lights, typically stationed behind the DJ booth or off to the side of it. Alas, when imagining doesn't work, I usually just show them a stock photo. If all of the above information hasn't convinced you that you have to have dance floor lighting at your next event yet, then here are some photos that should and will from recent celebrations..
Are you ready to turn up the night? Well, at least on the dance floor anyway. Then give us a call! To learn more about our full line of custom lighting options, confirm our teams availability for your upcoming wedding and event, or just to talk with one of our event managers, then please contact us in the office today!